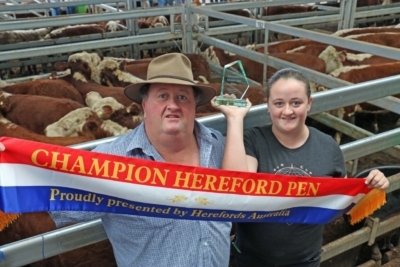 on winning the Herefords Australia Champion Pen at Wodonga, January 11. David McCormack, Bullioh, won the Herefords Australia champion pen for his 22 autumn drop steers, Mawarra blood, 388kg, and selling for the top weaner price of $1150 or 296c/kg. Photo and details courtesy of Kim Woods, Outcross Media. Mawarra Manitoba daughter wins Calf Champion and tops the sale at Sydney Royal Hereford Feature Show. Congratulations to Kanimbla Poll Herefords on a highly successful 2018 Sydney Royal Hereford Feature Show. Their team included a Mawarra Manitoba daughter, Kanimbla Tia Maria N005. She was awarded Calf Champion and sold for the sale top of $12,000. Kanimbla’s team of only six cattle took home the Most Successful Exhibitor award, an impressive effort and testament to the quality of their cattle. Mawarra Mustang son tops Brunswick Supreme All-Breeds Sale, Western Australia, February 15. 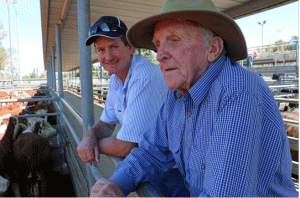 Tony & Tom Reardon were in Wodonga January 10, to see their Brooklyn Pastoral Co., steers sell. Their top pen sold for $1145 or 319c/kg. Read the full sale report…. The 26 Mawarra blood, 10 month old steers weighed 370kg and sold for $1400 or 378c/kg. Mr Davies described the steers as having weight for age, length, depth and shape. Read the full sale report…. Mawarra Sires will put your calves at the top end! 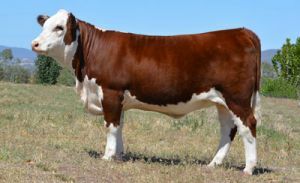 Bairnsdale September 4, 2015 – Mawarra genetics influenced a significant proportion of the yarding across the Hereford, Poll Hereford and Black Baldy’s on offer in Bairnsdale today with approximately 400 head boasting the genetic merit of the Stud’s bloodlines. 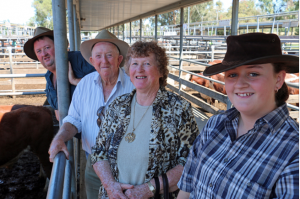 Prices topped, dollars per head, at $1,440 for a pen of Mawarra’s own steers. 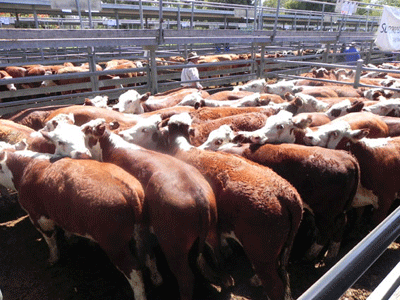 Continue reading the full report from Herefords Australia here. Vendors enjoyed record returns at the Anniversary Mountain Sales and our clients were rewarded for their excellent calves. Pictured at Omeo are the first run of steers and heifer calves, many Mawarra influenced throughout the draft. 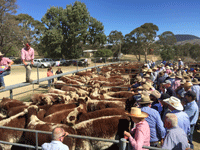 Continue reading the full report from Herefords Australia here. Strong competition for Mawarra genetics continued today with the McCormack family, Bullioh, offering the top pen of whiteface weaner steers at 249c/kg and Arthur Trethowan, Woomargama offering the top pen of Hereford heifers at 236c/kg. 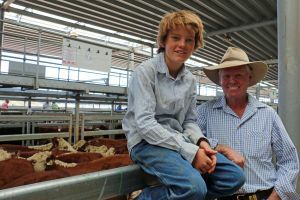 Frank and Jeanette McCormack, Bullioh, topped the whiteface weaner pens with 10-12-month old steers, weighing 383kg, and selling for $955 or 249c/kg. 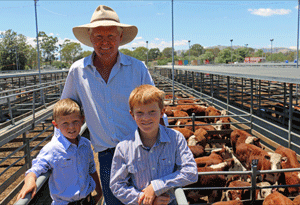 Tony Reardon and sons Ben & Tom, Brooklyn Pastoral Co, Mansfield sold a pen of 39, 373kg 8-10mth old steers, for the equal top Hereford weaner price of $965 or 258c/kg at Wodonga January 15. 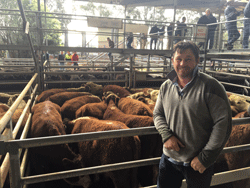 Mr Reardon averaged almost $900 for the 82 weaner steers he offered, up from a top price of $685 in 2014. 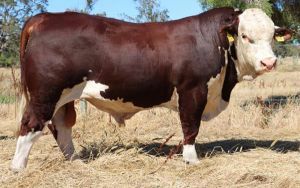 Mawarra bloodlines contributed significantly to the Brooklyn Pastoral draft, Mr Reardon has been sourcing bulls from Mawarra since the 1990’s. 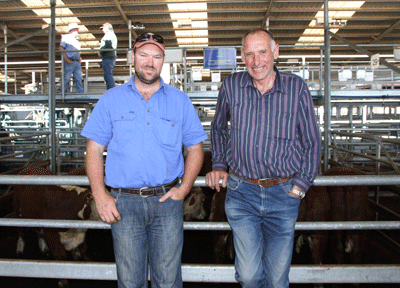 Consistent performance where it counts…..
Craig & Ken Hutton of Bairnsdale were happy with a top pen of $880 for a pen of 415kg 13-month-old Mawarra-bloodline Hereford steers…… There were many vendors with cattle bred from the Mawarra bloodline. Quote courtesy of Stock and Land The Hutton family sold heifers to a top of $570. 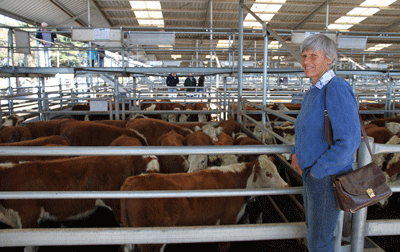 Ruth Hutton, Swifts Creek sold 8-10 mth Mawarra blood steers at Bairnsdale on August 29 to $725. 18x 8 mth old heifers sold solidly at $474. 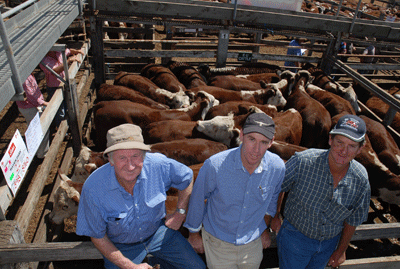 St Katherines, Darriman, sold 42 Hereford steers at the Heyfield sale to a top of $860 and average of $800. 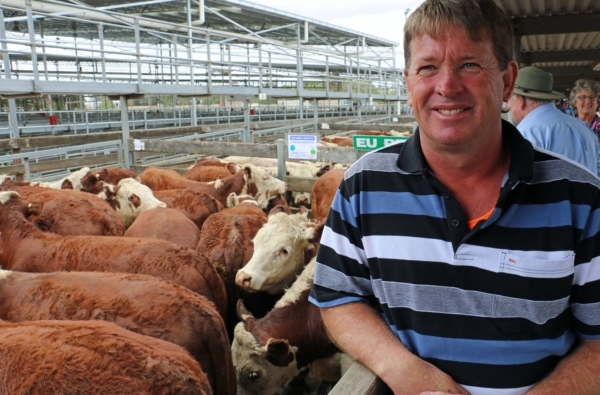 Breeding quality cattle gets good results, but having a repeat buyer bidding also helps. 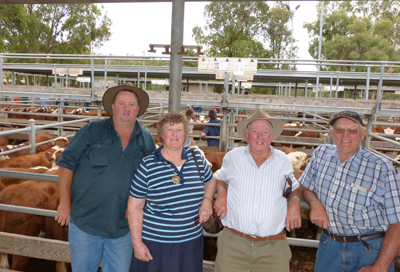 Neil Schmidt, Rutherglen (right), again purchased the steers offered by Jeanette and Frank McCormack, Tallangatta, (pictured centre with son David, left), at the Wodonga all breeds on January 3. Mr Schmidt said their steers were mainly by Mawarra bulls, which are known for their length and growth. He said his recent consignment of bullocks purchased from Frank and Jeanette weighed up to 800 kilograms live weight. Mr Schmidt also said their ability to grow out to these weights was why he kept buying them. The 21 steers, which weighed 351kgs, sold for $685. Congratulations to the Foster family, Haven Park, for topping the Annual Casterton Weaner Sale on January 11. Graeme & Rick Foster, pictured with Peter and their top pen of 22x EU accredited steers, predominantly sired by M. Vice Admiral, M. Vulcanize & M. Vice Chancellor, weighed 398kgs selling for $1.80/kg or $716/hd. 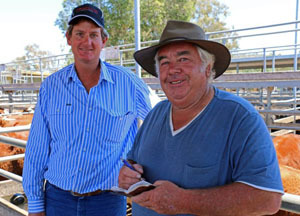 Mike & Tom Walsh, Granite Flat Pastoral Co. Mitta Mitta sold the top pen of Steers at the Wodonga Annual Weaner Sale held on the 5th January, 30x EU eligible, 8-10 mth old calves weighed 350kgs & sold for $875 or 250c/kg. The Foster Family, Haven Park recorded the heaviest pen of steers & recorded the top average at the January 6th Annual Casterton Weaner Sale. 22x EU eligible steers 396kgs sold for $879 or 222c/kg. 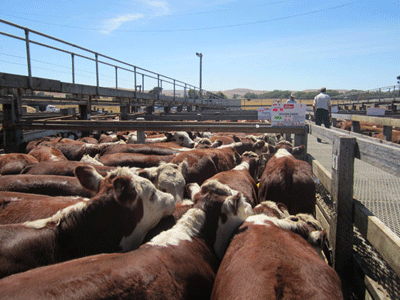 Haven Park’s 73 Hereford weaners sold from $753-$880, av $823.